Xi Jinping, general secretary of the Central Committee of the Communist Party of China (CPC), speaks at the press conference at the Great Hall of the People in Beijing, capital of China, Nov. 15, 2012. I am very glad to meet friends from the news media here today. The Eighteenth National Congress of the Communist Party of China came to a successful conclusion yesterday. During the past several days, you have extensively covered the congress and let the world hear China's voice. On behalf of the Secretariat of the congress, I wish to express our sincere thanks to you for your professionalism, dedication and hard work. We have just held the First Plenary Session of the Eighteenth Central Committee of the Communist Party China and elected a new central leadership; and I was elected General Secretary of the Party Central Committee by the plenary session. Now, I wish to introduce to you the other six newly elected members of the Standing Committee of the Political Bureau. They are: Comrade Li Keqiang, Comrade Zhang Dejiang, Comrade Yu Zhengsheng, Comrade Liu Yunshan, Comrade Wang Qishan and Comrade Zhang Gaoli. Comrade Li Keqiang was a member of the Standing Committee of the Political Bureau of the Seventeenth Party Central Committee, and all the others were members of the Political Bureau of the Seventeenth Party Central Committee. I believe their names are familiar to you. Here, on behalf of the members of the newly elected central leadership, I wish to express our heartfelt thanks to all other members of the Party for the great trust they have placed in us. We will strive to be worthy of their trust and fulfill our mission. We are greatly encouraged by both the trust all the comrades of the Party have placed in us and the great expectation the people of all ethnic groups in China have of us, and we are keenly aware that this is also an important responsibility for us. We have taken on this important responsibility for our nation. Ours is a great nation. Throughout five thousand years and more of evolution as a civilization, the Chinese nation has made indelible contribution to the progress of human civilization. In modern times, however, China endured untold hardships and sufferings, and its very survival hung in the balance. Countless Chinese patriots rose up one after another and fought for the renewal of the Chinese nation, but all ended in failure. Since its founding, the Communist Party of China has made great sacrifices and forged ahead against all odds. It has rallied and led the Chinese people in transforming the poor and backward old China into an increasingly prosperous and powerful new China, thus opening a completely new horizon for the great renewal of the Chinese nation. Our responsibility now is to rally and lead the entire Party and the people of all ethnic groups in China in taking over the relay baton passed on to us by history, and in making continued efforts to achieve the great renewal of the Chinese nation, make the Chinese nation stand rock-firm in the family of nations, and make even greater contribution to mankind. We have taken on this important responsibility for the people. Our people are a great people. During the long course of history, the Chinese people have, working with diligence, bravery and wisdom, created a beautiful homeland where all ethnic groups live in harmony, and developed a great and dynamic culture. Our people have an ardent love for life. They wish to have better education, more stable jobs, more income, greater social security, better medical and health care, improved housing conditions, and a better environment. They want their children to have sound growth, have good jobs and lead a more enjoyable life. To meet their desire for a happy life is our mission. It is only hard work that creates all happiness in the world. To fulfill our responsibility, we will rally and lead the whole Party and the people of all ethnic groups in China in making continued efforts to free up our minds, carry out reform and opening up, further release and develop the productive forces, work hard to resolve the difficulties the people face in both work and life, and unwaveringly pursue common prosperity. We have taken on this important responsibility for the Party. Our Party is dedicated to serving the people. It has led the people in making world-renowned achievements, and we have every reason to take pride in these achievements. But we are not complacent, and we will never rest on our laurels. Under the new conditions, our Party faces many severe challenges, and there are also many pressing problems within the Party that need to be resolved, particularly corruption, being divorced from the people, going through formalities and bureaucratism caused by some Party officials. We must make every effort to solve these problems. The whole Party must stay on full alert. To address these problems, we must first of all conduct ourselves honorably. Our responsibility is to work with all the comrades in the Party to uphold the principle that the Party should supervise its own conduct and run itself with strict discipline, effectively solve major problems in the Party, improve our conduct, and maintain close ties with the people. By doing so, we will ensure that our Party will remain at the core of leadership in advancing the cause of socialism with Chinese characteristics. It is the people who have created history, and it is the people who are true heroes. The people are the source of our strength. We are well aware that the capability of one individual is limited. But when we are united as one, we will create an awesome power and we can certainly overcome all difficulties. One can only work for a limited period of time, but there is no limit to serving the people with dedication. Our responsibility is weightier than Mount Tai, and our road ahead is a long one. We must always be of the same mind with the people and share the same destiny with them, and we must work together with them and diligently for the public good so as to live up to the expectations of both history and the people. Friends from the press, just as China needs to learn more about the world, so does the world need to learn more about China. And I hope you will continue your efforts to deepen mutual understanding between China and the world. 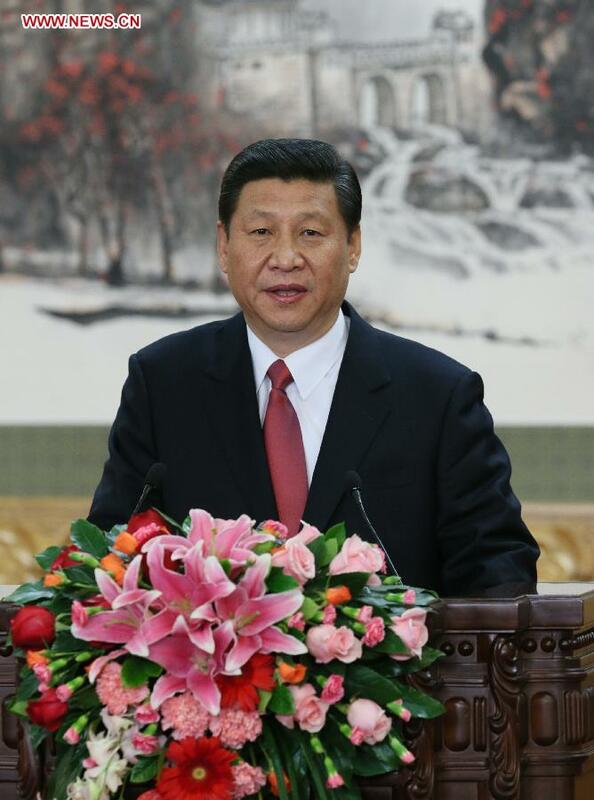 Here is the full text of the speech of Xi Jinping, general secretary of the Central Committee of the Communist Party of China (CPC), when he met the media after the first plenary session of the 18th CPC Central Committee on Nov. 15, 2012.